I was born the year we landed on the moon, but I went to school on another planet entirely. Growing up sheltered in a city nestled among Midwestern cornfields, I thought drinking wine was sinful (how could I anticipate the flawlessness of a pinot noir?) and listening to rock ‘n’ roll was a fast track to Hades (the Beatles had satanic backwards messages! I heard the proof!). I’ll just say it: I was groomed to be one of those conservative, evangelical fundamentalists. My book, my bane, my muse. As I learned early, when one is on such a path to heaven, it is imperative that one walks quietly and sits properly. Jesus likes that kind of thing. In the Christian school I attended, the boys went outside for P.E. while the girls stayed inside for charm class, under the implied tutelage of Jesus himself. My appropriately pink “Christian Charm Manual” brims with illustrations that obligingly show how a smile and well-coiffed hair work in tandem with a pure heart. Now that I’ve had a proper education, lived all around the country, traveled all around the world and enjoyed a spectacularly fascinating (to me, anyway) career, I can look back and be amused by the quirky education that defined my early days. Pulled out of public school after Kindergarten, I attended a small, Baptist, conspiracy-theory school run by a member of the John Birch society. He was a man devoted not only to instilling girlish charm but also to fighting the communists. During one fateful year, we learned all about the secret communist plot to take over America through the United Nations. Our principal based his curriculum on books that would never become classics – we read J. Edgar Hoover instead of Dickens, and especially instead of Dickinson. I suppose literature seemed irrelevant when only Jesus could save us from the secular humanists and communists who would steal our souls and throw us in concentration camps. (Only the communists wanted us arrested, not the secular humanists, as far as we knew. Not that we’d have put it past ’em.) The indoctrination worked: I was an earnest evangelical. So that’s my story, but I didn’t stick to it. More about that in my charmifesto. For me, the way to a new, shimmering metaphorical place meant several years of gradual shifts – after I knew what I didn’t believe, I wanted a full intellectual and emotional grasp of what I did believe. I rewired my brain. I found a new way of being in the world (which hasn’t happened to involve anything resembling church for many years). And I think it’s downright charming. Now I’m blogging – about the old charm school and my newfound charm-i-ness. Those of us who’ve found a peaceful way in the world need to talk about it. So please enjoy. Just don’t slouch when reading – turns out Jesus doesn’t like that kind of thing. Just kidding, Jesus. This entry was posted on September 19, 2008 at 3:50 AM and is filed under Charm School Notes. You can follow any responses to this entry through the RSS 2.0 feed. You can leave a response, or trackback from your own site. Wow, we went to the same high school and I honestly had no idea! I am a more than a little flabbergasted by the little I’ve delved into your blog so far. Of course admittedly, what I remember most about you is the rumor that you landed the lead in the musical, only to have to turn it down because your religion forbade you to prance around on stage in your bloomers. If I remember this wrong – please feel free to set me straight! 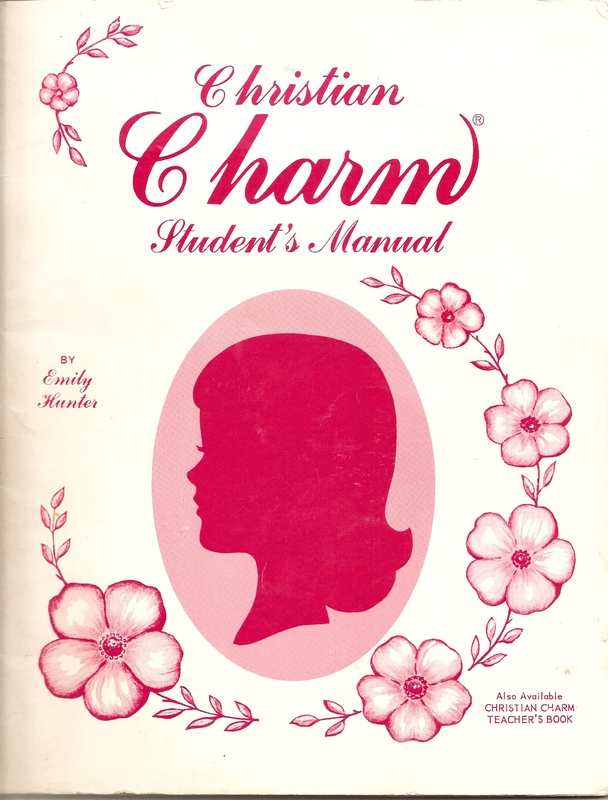 My natural curiousity wants to read your charm school manual, from start to finish, just to see what in heck it says! In the mean time, nice to see you again, great to see that you are doing well and are happy, and I am going to go read some more charming blogs! Hi, great to hear from you! Thanks for your comments – I appreciate the feedback. Yes, before I switched to public high school, some of my classes were a little more … strange. I hadn’t thought about that theater incident in quite a while: I did turn a role down, although I don’t remember bloomers being involved. Wearing bloomers sounds downright proper these days, yes? I stumbled across this blog after finding your brother and you on Facebook. It’s entertaining reading, for sure, but disturbing. I remember that y’all had to do those charm classes but we had no idea what they were about. I’m really sorry that you had to go through all that stuff. I’ve run across many of our classmates on Facebook and discovered that most of us had big issues because of that school. It took me a long time to figure out that following Jesus is nothing like that crap we were taught. Thanks so much for your kind thoughts, Bill. Sometimes it takes a few years to unpack all of that programming – that’s for sure. I know I enjoyed certain things about being there in school, too … we always find ways to thrive, I think. Congrats on your fatherhood. I hope all is well with you.